Windows has always allowed you to customize the volume of individual programs, but you couldn’t change what output device they used without relying on third-party software. But in the April 2018 Update (which you can download now How to Manually Download the Windows 10 April 2018 Update How to Manually Download the Windows 10 April 2018 Update The Windows 10 April 2018 update has finally begun rolling out to users. Read More ), Microsoft added the ability to change output devices per program in Windows 10. This allows you to, for example, play music from Spotify through your speakers while Skype calls always go through your headphones. Open Settings > System > Sound. Scroll down to the bottom of this page, and click the App volume and device preferences option. You’ll see a new page with various toggles. Master volume is like the classic Windows volume options. Set a value between 1 and 100 for all sounds, and choose your default input and output device. Below, you’ll find an App list with volume sliders and output/input devices for each one. System sounds controls Windows sounds The 5 Best Free Sites to Download Windows Sound Effects The 5 Best Free Sites to Download Windows Sound Effects Learn how to change your Windows 10 sound scheme. Here are some of the best free sites to download Windows sound effects. Read More like dialog boxes and notifications. You may also see multiple entries for one program for some reason. Adjust the volume for each app as a percentage of the master volume. For example, if your master volume is at 50 and you set an app to 50, that app will play at 25% volume. If you’d like to select an input or output device for an app other than the default, change it here as needed. Note that only apps you have open (and devices you have connected) will appear in the list. So if you’d like to adjust the volume for an app that doesn’t appear, make sure you open it. And don’t forget that you don’t need to open this menu for quick volume changes. Click the Speaker icon in the System Tray to quickly adjust the master volume, or right-click and choose Open Volume Mixer to adjust sounds on a per-app basis. 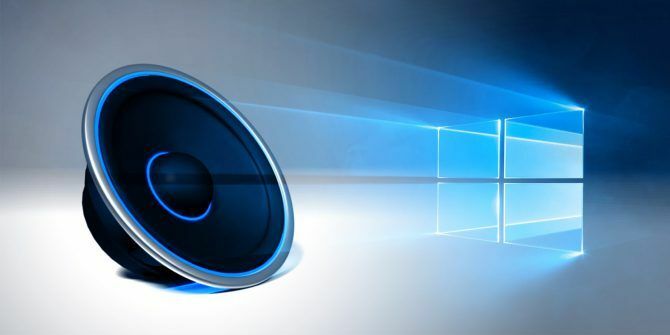 For more, check out how to improve sound quality in Windows 10 How to Manage, Improve, and Fix Sound Quality in Windows 10 How to Manage, Improve, and Fix Sound Quality in Windows 10 Windows 10 has many options to manage, customize, and improve sound quality. These tips and tricks will make your sound experience reach its full potential. Read More . Hi. I tried the 1st method and as soon as I did my pc wouldn’t boot anymore. Do you have any idea why this is? Is stuck on the repair screen. Before Redstone 5 I had a game I purchased from the windows store Halo Wars 2 was working fine before update was playing with my buddy who played on his XBox but after Red Stone 5 I found my game uninstalled thought it was weird so I tried to reinstall it wouldn't let me install kept giving off an error so now I feel as if I've been ripped off because I just bought the damn game and can't even play it tried every fix asnd I don't really want to reinstall Windows because it is also used as a Plex Server but I may have to if this issue isn't resolved.